Artillerymen are a peculiar breed. Part grunt, part Motor T (transport), part communications, and part deaf, they have a long lineage dating back to the Roman legions in 399 BC. From the Middle Ages through most of the modern era, artillery pieces on land were moved by horse-drawn gun carriages. In the contemporary era, the artillery and crew have relied primarily on wheel or tracked vehicles as transportation, though some of the largest were railway guns. Twenty-first century artillery consists of the M777 Howitzer as well as various other naval and land rocket pieces. Despite the years that separate the earliest artillerymen and today's modern warriors, for a number of centuries they've all shared one thing in common -- the veneration of Saint Barbara, the patron saint of artillery. Legend has it that Barbara was the daughter of a wealthy pagan by the name of Dioscorus. They lived in Asia Minor (near present-day Turkey or Lebanon) around 300 AD. Realizing his daughter's beauty, Dioscorus would imprison Barbara in a tower when he would leave for extended periods of time. However, despite his best efforts, Barbara eventually converted to Christianity. Upon learning of his daughter's conversion and refusal to denounce her Christianity, Dioscorus dragged her to the local magistrate who had her tortured before ordering her to be beheaded. Dioscorus carried out the beheading with his own sword. On his way home, following the beheading of his daughter, a tremendous bolt of lightning stretched out from the sky and struck Dioscorus down. The only remains were that of his sword—a reminder of his evil deed and the wrath of God. 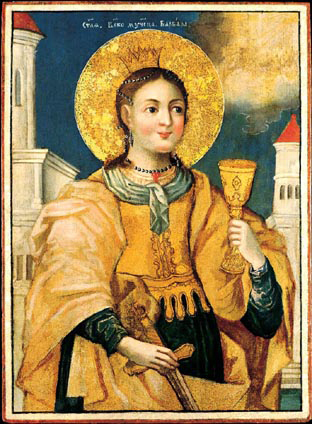 Because of her faithfulness to God and the lightning bolt that avenged her, Barbara became the venerated saint of those who were afraid of thunderstorms, fire, explosions, and sudden death. Later, in the 17th century, artillery gunners adopted her as their patron saint as well. Today, artillerymen throughout the world recognizes Barbara as the patron saint of their craft. Once a year, Marine artillerymen gather to honor Saint Barbara and celebrate the day of her feast (December 4), a tradition for all professional artillerymen. At the gathering, a robust meal is served and the making of "artilleryman's punch" takes place. It is an enthusiastic celebration all artilleryman Marines enjoy, and is the occasion in which the newest artillerymen are inducted into the Order of Saint Barbara. 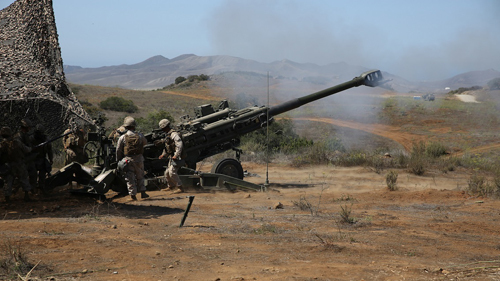 —Marines the 1st Marine Division fire an M777 Howitzer during an exercise at Marine Corps Base Camp Pendleton, California.